As soon as I saw this it was a done deal. It's a sausage dog for goodness sake! It now hosts my "dainty" (oh how I have started to hate that overused word) ring collection and a couple of pairs of my most worn studs. So here we have the collection as it stands today....from the top everyone! 1) The Pearl Studs - I will never get over how good these look on. It doesn't matter whether they are the real deal or from H&M, pearls look good. Just don't go the whole hog with a twinset and matching necklace. 2) The Diamond Studs - whenever people ask me what to buy in Dubai I always reply "diamonds". It makes me sound like Joan Collins but buy anything like that here and when you take it back to the UK (or any other country) it will be worth twice (if not more) the price...a very sensible investment I think. I also say this because very little else actually works out cheaper. These were from Cara in the Gold and Diamond Park - the only place to go. 3) The Infinity Knot Ring - there are so many of these on etsy. Here's just one link for you - Link! This fits just above the knuckle and the rule of thumb when ordered a knuckle ring is to go maybe 1-2 sizes down from your regular ring size. This is such a simple ring but I really love wearing it - simplicity often makes the most impact. 4) The Hamsa Ring - Link! - I love my little amulets...tell me that something is for protection and I will have my wallet out in a blink of an eye. I got this recently and it's a pretty rose gold ring with pave Swarovski crystals. It catches the light beautifully and is extremely delicate. 5) The Arrow ring - I picked this up at a market in Dubai and I have tried to find a seller online....but failed. I am sure eBay will bring up the goods - it's rose gold plated with more Swarovski crystals. I wear this as a knuckle ring. 6) The Love Ring - Link! - I get so many questions about this and mine is by Sydney Evan. It's the original Love ring and has pave diamonds but to be honest, in the years since I have got this countless copies have emerged and they are practically identical. I would go for something like this - Link! - it's the prettiest and most delicate one I have seen for under £40. 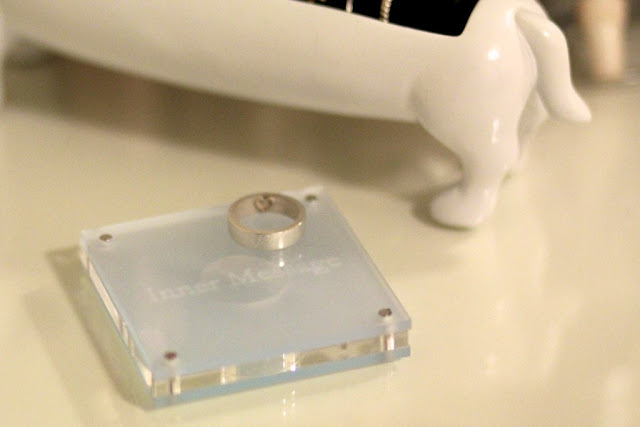 9) The Inner Message Ring - Link! - ah I love this and it was a purchase totally driven by a "Pin" on Pinterest. The premise behind this ring is so original - on the surface it appears a simple, boring (but good quality) silver band. On the inside however is a message - it can be "always" or "marry me" but I stayed true to the heart theme. It wears tightly on your skin and leaves that impression behind when you remove it. It wasn't cheap but I like to support artists with ideas like this and I thought it was special. It cames from Korea and was shipped to me in about a week. So after all that I think my all-time favourites are probably the Love and Infinity rings and when I think about it that's the combo I wear most often. They are the two that feel weightless and have the most visual impact. And regarding the collection...don't worry - I never put all them on at once. I did it for the photo below and I think it's safe to say "daintyringparty" will never trend. PS. The Sausage Dog holder is from ASOS - Link! - and was £15. A mini bunny for $10 from etsy - Link! I either need help or acceptance because this obsession with dainty rings is just never going to end, is it? Cute dog and nice collection! Thanks for sharing! I saw this on Instagram, it's so cute! So cute! I throw all my rings and necklaces in a tea cup with a saucer, which was nice, until I saw this! I'm buying this for my sister right now! i loooooove it! i totally need this! Hi, Laura, the sausage dog is too cute! All your rings are sososo pretty and delicate. Love them! If you really want to untangle the necklaces, I read somewhere on the internet that baby oil can make them slip more easily. The 'love' ring is so pretty. I think that one is my favourite. That ring holder is really the cutest thing! I love it! Soo cute! The ring holder is adorable! That has to be the cutest thing I have seen in such a long time, I just have to have a sausage dog ring holder!! the infinity ring is a timeless piece, but more to the point this ring holder is SUPER cute, good old asos never fails!! You have the best ring collection ever! Cute doggy stand too!! I adore your ring collection! 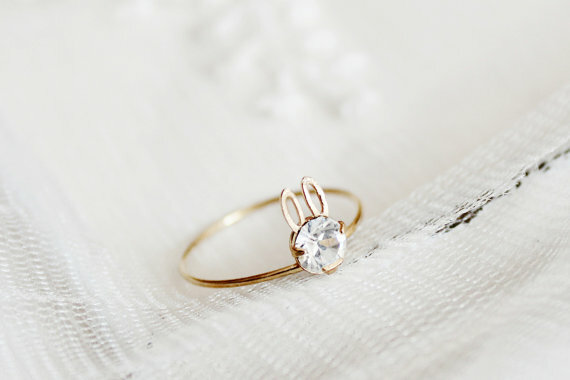 The little bunny ring is so delicate and pretty and the inner message ring-just awww! Love this little doggy, so cute :) I'm really bad at wearing rings, unless they're the enormous cocktail ones. This is so adorable (and also hilarious?)! I kind of need that bunny ring in my life now. Ha! 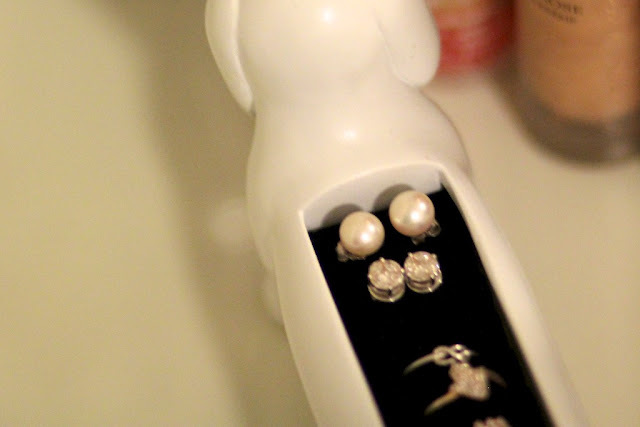 That doggie ring holder is too cute~! Don't feel bad about your dainty ring collection - mine seems to be 'stacked rings' .. I must have them all !! What an incredible collection! The sausage dog holder is the cherry on top. I have to say the arrow ring is my favourite ... hmm so a trip to Dubai in the near future?! Great idea for a ring holder - I thought it was a design piece tbh and not something that could be found on ASOS! Now your dainty ring collection looks super neat! Accessorize has a really cute arrow ring in silver for £8 and its free delivery right now!!!. I was looking for some below the knuckle rings, thanks! The bunny ring is so adorable. Ah I love him, that's so cute! love the dainty rings! I wear an Ankh/Ankt? ring and a dainty heart ring all the time along with an inner message silver ring as well. 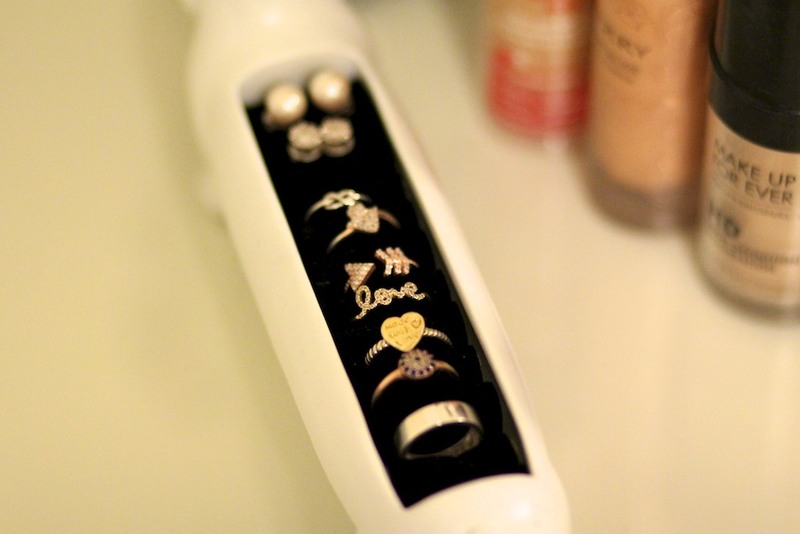 What a beautiful way to display your delicate ring collection! I love the infinity knot, the heart and the love script ring. Looks as if the Made With Love ring is on sale at the moment too... bonus!... oh, too bad all the small sizes are sold out. Bummer :( I wonder if there's anywhere else I can snag this ring...? Where did you get the weenie dog ring holder. i neeeeeeed one. Amazing post! That ring holder is really the cutest thing!. The cutest accessory holder is in itself a great accessory ! free to use on your device. With the assistance of this application CreeHack monotonous stuffs which stuck you during the video game play. Allow me clear all your questions with the quick sight vivavideomaker You would certainly not be sorry for to download and install viva video clip application. Netflix has material that draws in more of the customers worldwide. Netflix Login It permits you to watch endless TELEVISION shows and films with one low monthly rate.